Ah. A tale of two Supreme Protector's Tip of the Hat™ recipients. If ever there was an opportunity to snag an easy Supreme Protector's Tip of the Hat™, it was this week. Who would be quickest on the buzzer? 'Twas Comnena, a new shareholder who purchased 50 shares--more than plenty, under the circumstances. Comnena's purchase took us up to and through the 1,559 billion isk mark and earned her a Supreme Protector's Tip of the Hat™. Of course, timing isn't everything. Some shareholders go for the gold, and they're not willing to wait until the moment is ripe. They shape circumstances by taking bold and decisive action. Now that's an EVEmail that crackles with energy. If anyone in the Anti-Ganking movement still wonders why they can do nothing but fail--they should ask whether there's a single Anti-Ganker who could write an EVEmail like Black Pedro's. 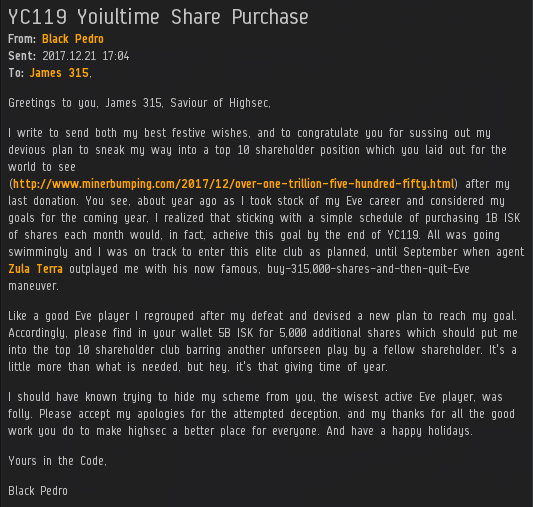 Black Pedro stepped up his game, purchased 5,000 additional shares, and earned a place in the top 10 shareholders of all time. His victory was made complete with the addition of a Quintuple Supreme Protector's Tip of the Hat™, which was awarded for taking us past the 1,560, 1,561, 1,562, 1,563, and 1,564 billion isk marks. EVE Online, what a game. And there's no secret why, the Code wins because it is the most relevant aspect of EVE highsec play. It's influence having spilled over into low and null, and even other games, it affects more individuals than any other player driven movement in the game. Only the most deviant of shitters will try to resist, and those players are easy to find and blap. All you need is a few well placed "praise James"'s and the slugs will be unable to stop themselves from breaking the TOS by shitting up local chat. Never forget shardani and what he did. When life gets you down....kill a minor. @Black Pedro - welcome to the club! Whats missing from ag?.... Just the f.
Strange how that works out huh?